Friday, July 6, 5-9 p.m.
What do Chief Hopocan and Olympian Glenn “Jeep” Davis have in common? Their watercolor likenesses will be part of the Summit Artspace on Tusc exhibit, Barberton, A Brush with Magic, by artist Don Jeffrey. 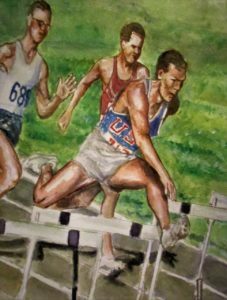 Glenn “Jeep” Davis by Don Jeffrey Barberton residents will see one of their own who achieved Olympic fame in the new show at Summit Artspace on Tusc. Artist Don Jeffrey depicts Glenn “Jeep” Davis doing what he did best in one of the works in Jeffrey’s show, Barberton, A Brush with Magic. Davis was a hurdler and sprinter who won three gold medals in the 1956 and 1960 Olympic games and went on to teach and coach in Barberton. 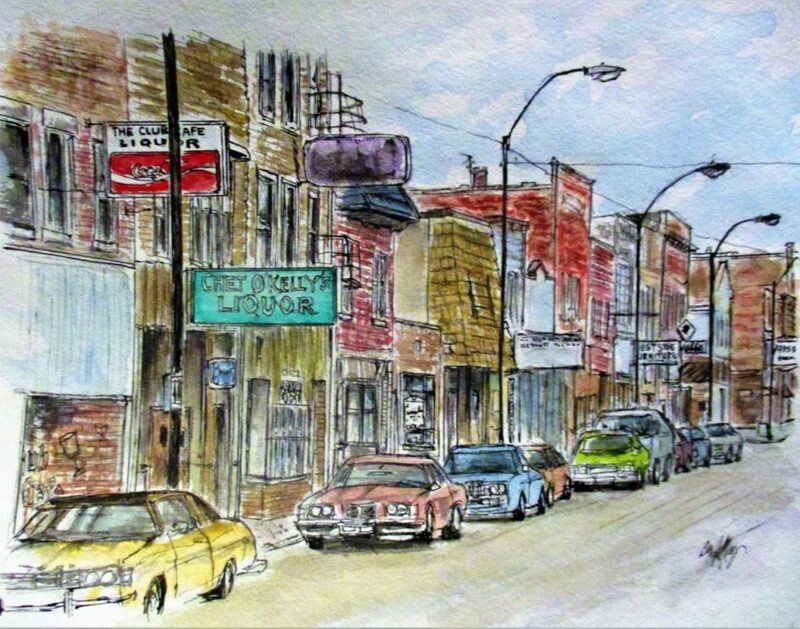 The exhibit in the newly-arranged gallery at Summit Artspace on Tusc will open with an artist reception on Friday, May 25, 5-9 p.m., for Barberton Fourth Friday. The art center is located at 571 W. Tuscarawas Ave., Barberton. With a fun surprise arranged for the first floor windows on the avenue, the exhibit will run through July 14. The regular gallery hours will be Fridays, 5-9 p.m. and Saturdays, 12-5 p.m. The exhibit is free and open to the public. “This show is not just for Barberton. Residents here and across Northeast Ohio are going to see beautiful depictions of familiar places from the present and the past,” said Kamelia Fisher, executive director of Summit Artspace. There will be a “meet the artist” evening with Jeffrey on Friday, July 6, from 5-9 p.m. in the gallery. The event is free and open to the public. Jeffrey, who lives in Kenmore, is a commercial artist. He has spent most of his career as a visual merchandiser, working to create displays for retail businesses. But as a young adult he was as a cartoonist in college and still creates cartoons, greeting cards and humorous illustrations. “Two years ago I shifted my focus to watercolors and pen and ink and the work has been well received. I enjoy painting familiar places and points of interest not just as they appear today but also working from vintage photos to help the viewer take a step back in time,” said Jeffrey. 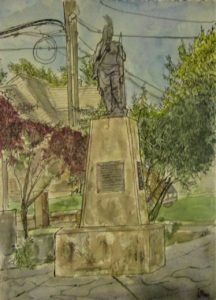 Artist Don Jeffrey uses watercolor and pen and ink to illustrate the Portage Park stature of Chief Hopocan who was an 18th-century chief of the Algonquian-speaking Lenape (Delaware) and a member of the Wolf Clan. He studies history and appreciates how towns were settled and developed. “I especially love the great exterior design and craftsmanship of the old 19th and early 20th century buildings,” he added. Jeffrey strives to tell stories that his viewers can relate to from experiences in their own lives and to inspire an emotional connection. He counts Norman Rockwell as one of his influences and also Joseph Leyendecker, Iian Stewart, Chien Chung Wei and Joseph Zbuckvic. Summit Artspace on Tusc’s gallery is open Fridays, 5 to 9 p.m.; and Saturdays, noon to 5 p.m. during exhibitions. The exhibit will be open for June’s Barberton Fourth Friday, June 22. The gallery is handicap accessible and there is an elevator in the building to access artist studios on the second floor. There are also artist studios on the first floor.